From the Arenal area it’s a real pain to get to Monterverde as you have to retrace your steps around the lake until you take the turnoff at Tilaran. You’ve then got 30km or so of uphill gravel road until you get to Santa Elena. As we were to find out this route in is rougher than the more direct route from the PanAm via Sardinal. Santa Elena is a small touristy town. Every other building is a hostel, coffee shop or tour agency. Flat space is at a premium and the roads are steep and it seems like every space is built on. So we were pleasantly surprised to find a vacant lot in the middle of town which was a good place for us to spend the night. 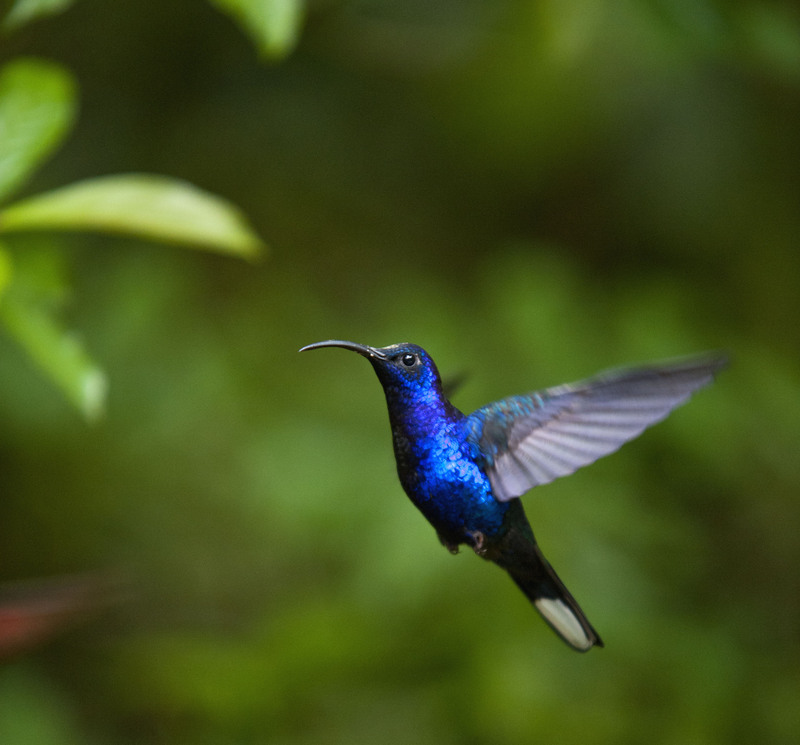 At over 1000m, Monteverde is in cloudforest and is subject to a different climate – cool and wet, which was a welcome change from the heat of the lowlands. 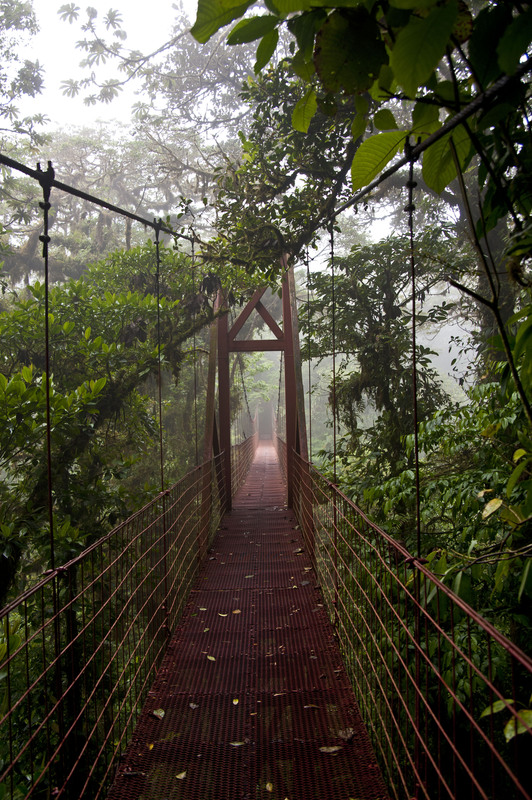 We arranged to go for a guided hike in the Monteverde reserve the next morning. 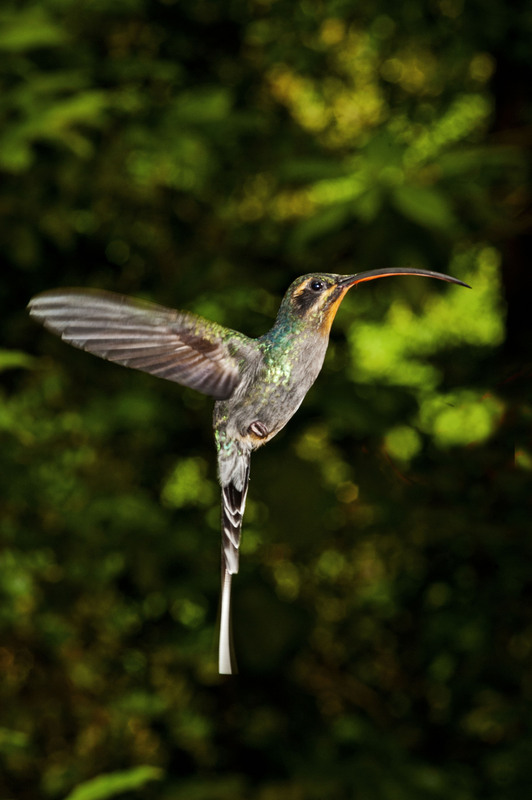 At the entrance to the reserve is a café and gift shop called the Hummingbird Gallery, which has several hummingbird feeders on the patio out front under constant assault from many different types of hummingbirds and a few insects as well. We headed out on our guided hike in a small group of only four with a guide with great English. This was our first time in proper cloud forest and we learnt a lot about it. 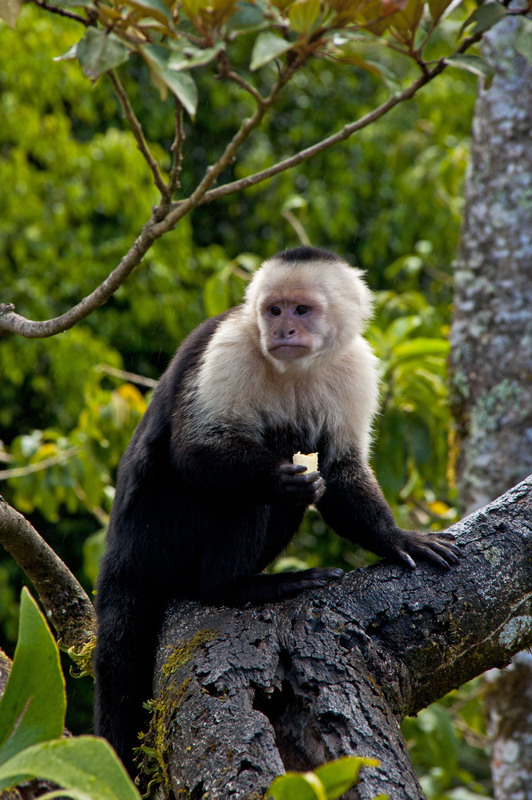 Monteverde is a privately run reserve and 90% of it is not accessible to tourists but is set aside as an untouched preserve. 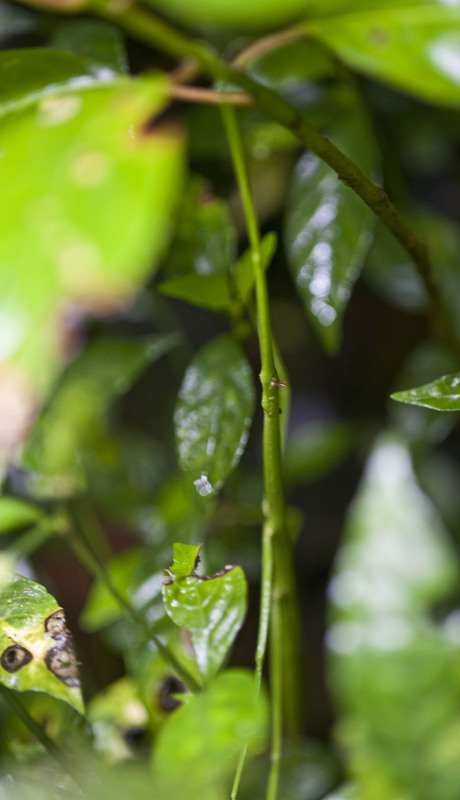 We also learnt that the secondary forest (where the original cloud forest has been cut down in the past) may take up to 1000 years to regenerate and even then it is estimated that it will only be 80% as bio-diverse as the primary forest. We saw some howler monkeys in the forest which is pretty rare, they usually keep to the private part of the reserve so we were quite lucky to see them. 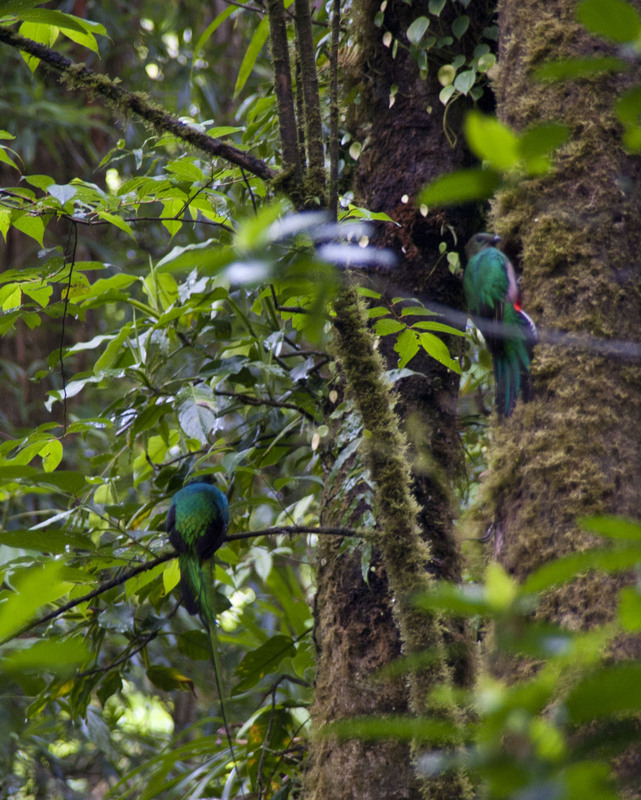 The highlight of the hike was seeing a pair of Quetzals (supposedly the most beautiful bird in the world) who were working on building a nest. 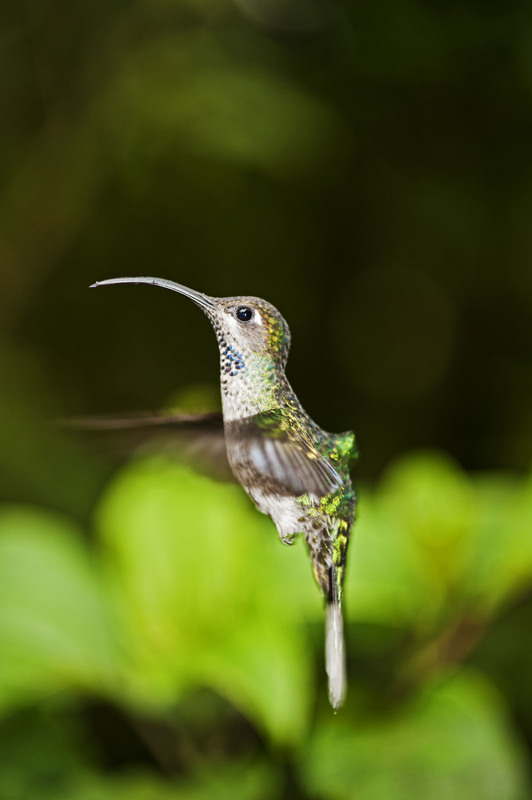 They only have soft beaks but they still dig a hole in a tree to use as a nest – if the wood on the tree they pick is too hard they will abandon it. We also saw a toucan, several Black Guans (big birds), a hummingbird in a nest (very small I can tell you), a squeaky door (type of bird which has a call just like a squeaking door) and an adult and baby Walking Stick (stick insect). 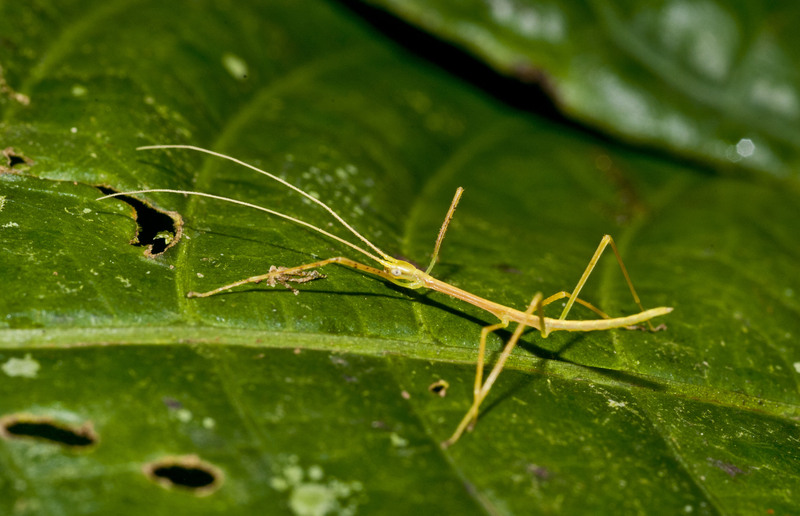 The stick insect is nocturnal and seeing one in the day is very rare as they are incredibly well hidden in the foliage. After our guided hike was over we also walked some of the other trails in the park. We saw a lot less without a guide though. The best bit of our self-guided hike was walking over a hanging bridge that effectively lifts you up into the canopy to give you a perspective of another layer of the forest. The number of airplants is amazing. In fact earlier, our guide had told us that a study of one tree had shown over 200 different species of plants living on it. 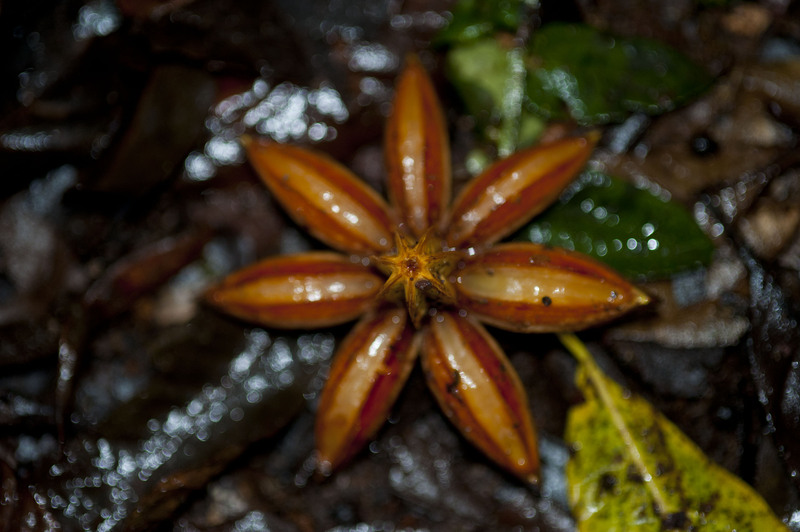 We spent the whole day in the cloudforest and then went back to Santa Elena for the night. In the morning we visited a coffee shop just next to where we had parked. As we were having some breakfast a white faced capuchin monkey came to the back door and hung around outside until it got it’s morning treat – a small banana. Yes that is the same type of monkey that Ross had in Friends !